Season's greetings! 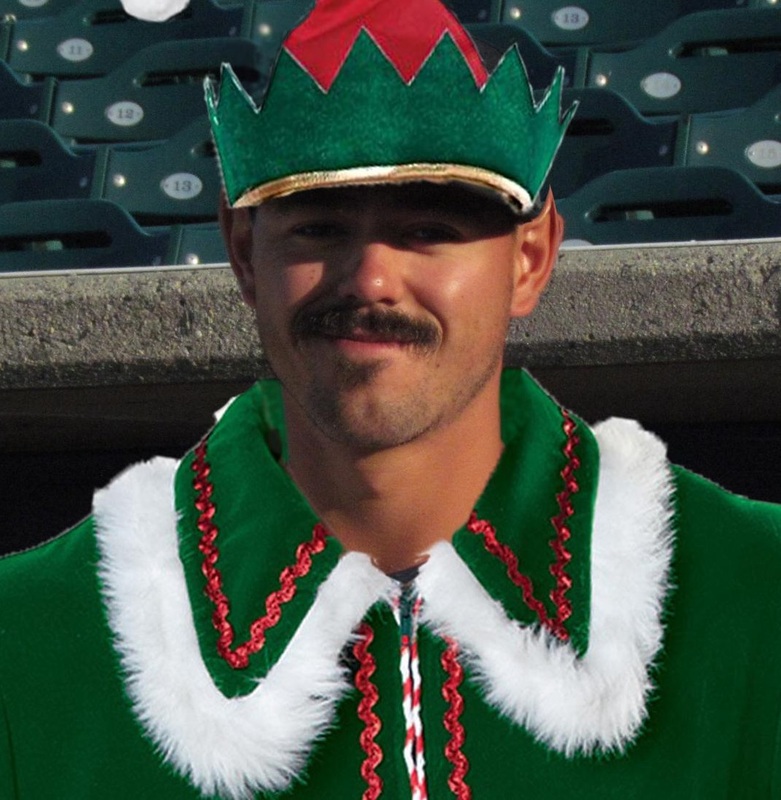 Everybody loves the holidays and, of course, baseball players are no exception. 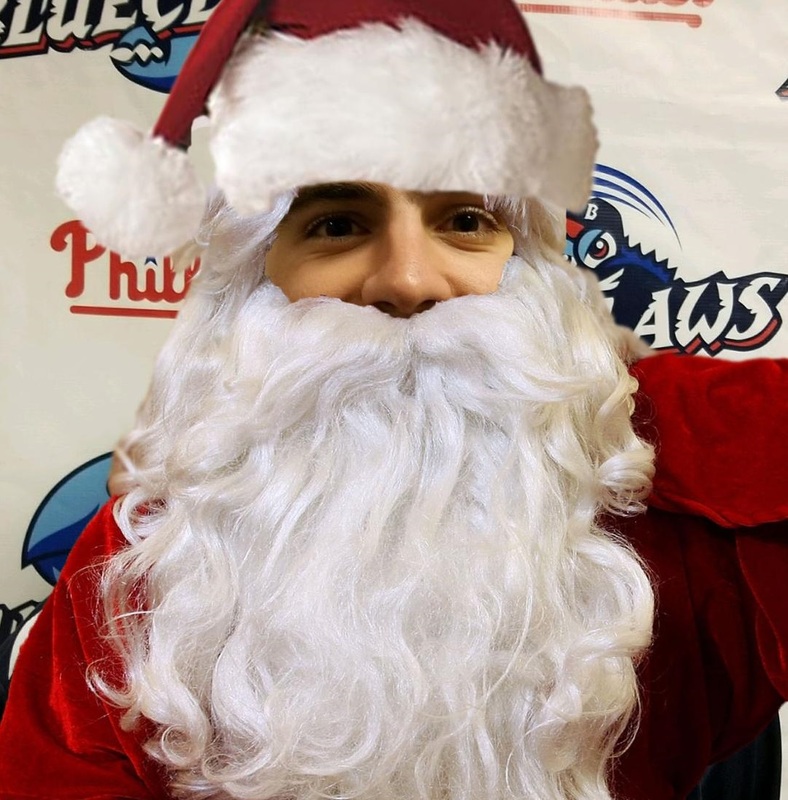 Every year at Christmas time, I survey a group of Phillies prospects about what they get excited for during the holiday season. Players taking part in this year's eighth annual Christmas questionnaire include this year's top Phillies draft pick Adam Haseley, starting pitcher Jacob Waguespack who wrapped up the 2017 season in the playoffs with Triple-A Lehigh Valley, Double-A second baseman Drew Stankiewicz, Class A third baseman Luke Williams as well as Class A All-Star pitchers Will Hibbs, Trevor Bettencourt and Nick Fanti. -What is your favorite Christmas song and which artist or version do you like best? Haseley- The Christmas Song by Michael Buble. Hibbs- Oh man, "All I Want for Christmas is You" by Mariah Carey is a jam. It's just a universal Christmas song that gets everyone in the holiday spirit! Stankiewicz- Grandma Got Run Over by a Reindeer. Fanti- Well, I'm not huge on Christmas music, but I think any version of any Christmas song is sung best by yourself in the shower. But probably any Jingle Bells version. Bettencourt- It's not conventional, but I actually had heard it last year and it is hilarious and I love it. It's called The Holiday Rap, so if you look it up on Spotify, it cracks me up and I love it. It's great. Waguespack- I would have to go with N Sync, what's the name of it? (I asked if it was "Merry Christmas, Happy Holidays"- he confirmed that was it ) That's the jam right there. That song will never get old. That's the best for sure. -What is your favorite Christmas movie or TV special? Haseley- Frosty the Snowman; it’s on our little VCR cassette tape thing at our house and we used to watch it every year. Oh, it’s like the old school one. Hibbs- The "Home Alone" series, no doubt. Watching the Wet Bandits (Marv and Harry) get continually outsmarted and injured by a 10 year old never gets old. Williams- Home Alone. It's, for sure, a family favorite in our house. Stankiewicz- The Grinch because growing up my family and I would always watch it before we set up our tree. Fanti- My favorite Christmas movies are probably Home Alone, Elf and the beginning of the movie Ted. But overall, probably Elf because Will Ferrell is so funny in that. Bettencourt- I'd probably have to go Home Alone. I don't really watch too much Christmas specific stuff, but I'm a pretty big fan of Home Alone. You can't beat it. Waguespack- I think I have to go with Elf. Will Ferrell...he's the man. You know, that movie is another one that I don't think will get old. I just love that movie. -Do you have a favorite food to eat at the holidays and who makes it? Haseley- My mom makes ham for both Thanksgiving and Christmas. So, we have ham and turkey for Thanksgiving, and just ham for Christmas. It’s mom’s ham! Hibbs- I don't discriminate. Everyone in my family makes awesome food around Thanksgiving and Christmas. If you held a gun to my head, I would have to say deviled eggs. Williams- My mother makes a huge turkey feast for us. We do this because for Thanksgiving we go to my aunt and uncle's house, so this gives my mom the opportunity to make her own turkey feast for us on Christmas. Stankiewicz- Tamales. My Grandma always makes then from scratch. Fanti- My favorite food is anything that comes from my brother-in-law's restaurant Fanatico. They cater my Christmas and sausage and peppers and the fish is great. Bettencourt- My mom every year for Christmas makes this seafood cioppino, it's pretty amazing. Everybody comes over, you get some rubber gloves, so you don't smell like fish, you crack into some crabs, some shrimp and she kills it. I love it. Waguespack- I gotta go with my Mawmaw Rose, she makes a chicken and sausage gumbo. You know, I'm from Louisiana, so she makes a killer chicken and sausage gumbo and we throw some potato salad in there and that's a Christmas Eve tradition right there. -Do you have any big family traditions at Christmastime that you look forward to? Haseley- There is an event at our church called The Singing Christmas Tree that we go to every year. It’s kind of hard to explain, but it’s basically a bunch of singers in these really tall Christmas trees and there’s a storyline and stuff like that. So we go to that every year. It’s the same Christmas story, but they change it up. Hibbs- My family always takes turns opening gifts, rotating from one person to the other, one at a time until all the gifts are opened. I used to get frustrated when I was younger because it took so long, but now I appreciate it because it allowed us to spend more time together during the best day of the year. It's even more special now when my brothers and sister are in town because it's rare that all of us kids (and respective spouses) are in the same room together. Williams- On Christmas Eve we go to my aunt and uncle's house to have dinner and open gifts from our cousins. We do a Secret Santa with all of our cousins from my father's side of the family every year. Stankiewicz- My family plays a card game called Castigo, which means "penalty" in Spanish, and we are all way too competitive and always end up in a big fight. My brother, two sisters, mom and dad and Grandma all play.. It's essentially the Mexican version of Rummy. Fanti- Every year my family does a Secret Santa with my sisters and I so I always look forward to that. We also do a White Elephant game where you get a number and take a present but the fun part is people can steal the present from you so it gets really intense and funny. -Does your family have a Phillies ornament on the tree? Stankiewicz- We do not (laughs). Fanti- Yes, there's a picture of my parents with me in a Phillies uniform hanging on the tree. My mom wanted to put a Phillies hat or something on the angel, but that was a little too much for me. Bettencourt- No, we do not. Maybe this year, who knows? Waguespack- I would have to say 100-percent yes, because my mom probably has five at least. -Do you have a standout Christmas gift from childhood that still sticks in your memory? Hibbs- Santa got the family a ping pong table one year, and we played on that table religiously until it fell apart. Williams- One year I got an electric scooter and I want to say I rode that thing everyday for hours. I was in love with that thing. That's probably why it only lasted maybe a year. Stankiewicz- I remember my first big barrel bat. The TPX Response. Fanti- For some reason one of my most memorable gifts was when I customized a skateboard and my parents said they didn't get it but then they did and for some reason I was so excited about it, so I shredded for about a month before falling on my arm and I never touched it again. Bettencourt- I'd probably have to say my first Rawlings glove. I remember going to store with my dad, like the week before. We were getting something else and I was looking at the gloves and I had a random glove, nothing special and when I woke up Christmas morning, I had this burnt red Rawlings glove and I was too pumped about it. I don't know what happened, I don't know how it happened, but I opened it Christmas morning, (it was) stiff as a rock, ended up leaving it on top of the TV, no sunlight, no nothing. Picked it up the next day and it was nice and soft and kind of broken in and it was still in the little case and I was shocked. So, I'll chalk that up to a little Christmas miracle. Waguespack- I would say that one of my grandmothers, we have a blended family on my dad's side, so my step-mom's mom actually one Christmas, there's six grandchildren, one Christmas she gave us all electric scooters, so that was huge. I think we were nine or ten and those had just came out and were a lot of fun. -Do you recall finding out the real deal about Santa and is there a story to go with it? Haseley- I don’t. My sister’s older than me and I think she found out and I probably found out from her. Hibbs- What do you mean...? Williams- I don't remember what age but I'd have to say around 10-12 I had all these thoughts about Santa and people saying he's fake and one day it just hit me that there's no way he's real. So yeah that's my story. Pretty boring I know. Stankiewicz- When I was younger I tried to stay awake for Santa to see what he looked like in person and I snuck out of my bedroom and saw my dad eating the cookies (we left for Santa). I screamed and yelled, "Those are for Santa!" Then I realized the note was in my dad's exact handwriting. Fanti- Well, I won't name any names, but one of my sisters used to be tough to get out of bed and she lashed out because she was cranky and I was excited for Christmas. Waguespack- No, not really, 'cause I've got two older brothers, so I probably think they knew as they got into middle school or whatever, but they probably didn't say anything, so I could have the spirit for a couple more years, but I think it was kind of one year where we all just figured it out. I remember driving in the car and my mom let it slip about (the Easter Bunny) and we had my brother and someone else in the car and she kind of let it slip and I had already kind of knew, but after that it was confirmed. Previous editions of this survey include answers from Aaron Nola, Rhys Hoskins, JP Crawford, Mark Leiter Jr., Cameron Rupp, Scott Kingery and loads of others. Those editions of this holiday survey can be viewed at the following links- 2016 survey, 2015 survey, 2014 survey, 2013 edition, 2012 edition, 2011 edition and 2010 edition. Happy holidays, everyone and thanks to Eric Floyd for the photo editing.